From Elizabeth Taylor to Justin Bieber. Dating is hard. Dating in Hollywood is even harder. When everyone is trying to make a narrative out of your life, it's nearly impossible to have a functional relationship or breakup. 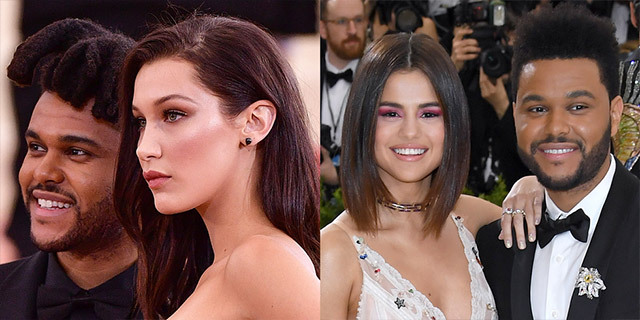 Selena Gomez's reconnection with Justin Bieber has everybody wondering if it had anything to do with her recent breakup with The Weeknd, and it's not the first love triangle her ex has found himself in. Take a look back at some of the celebrity love triangles that shook Hollywood to its core, from its early days up to today. 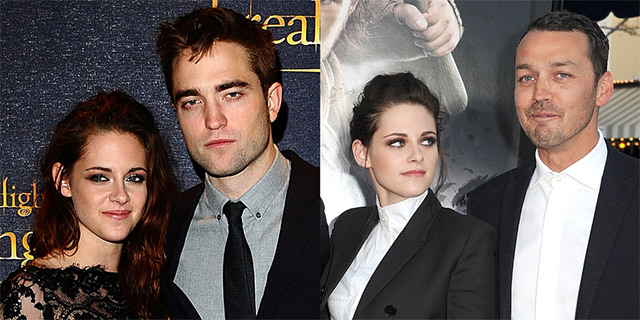 In the height of Twilight madness at the box office, Kristen Stewart and Robert Pattinson was every teen's dream—until photos of Stewart and Rupert Sanders kissing were published by Us Weekly. Sanders, who was directing Stewart in Snow White and the Huntsman, was married to model and actress Liberty Ross at the time. After issuing apologies, Kristen and Robert ended up getting back together, only to break up again in 2013. People reported that Sanders' wife filed for divorce in 2013. Robert Pattinson was recently engaged to FKA Twigs until October when they called it quits, according to People. Kristen Stewart has been dating model Stella Maxwell since 2016 and recently revealed that she is bisexual. Tyga and Blac Chyna started dating back in 2011 after she starred in his music video for "Rack City." The couple later moved in together and, in 2012, Chyna gave birth to their son, King Cairo. Soon after, TMZ reported that the couple was engaged, and that lasted until 2014 when the couple split up. 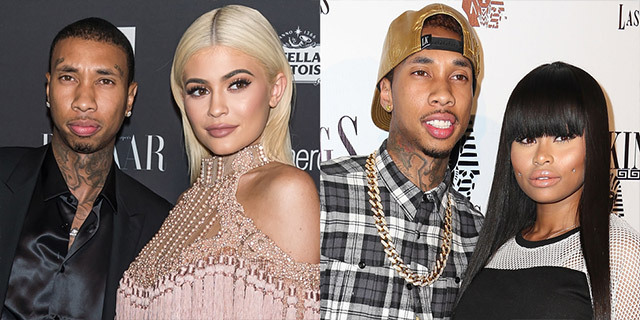 Tyga later got together with Kylie Jenner, and in 2016, Chyna started dating Jenner's older brother, Rob Kardashian. Rob and Chyna announced their engagement on Instagram after only a few months of dating. The couple later announced that Chyna was pregnant and she gave birth to a daughter, Dream Renée Kardashian. Chyna's relationship with Rob caused controversy due to Jenner's relationship with Tyga. Tyga and Jenner split mid-2016. Soon after, Chyna split from Rob and later sued the entire Kardashian/Jenner family, claiming that they are the reason her current show ceased production. The Weeknd and Bella Hadid had a normal on-again, off-again relationship until late 2016, when the couple decided to call it quits for good due to scheduling conflicts, according to People. The Weeknd would later start promoting his new album, Starboy, and the two would reunite on the runway during the 2016 Victoria's Secret Fashion Show. Soon after, it was announced that The Weeknd started dating Selena Gomez and Hadid reportedly felt "betrayed" by the new relationship. But that couple recently called it quits, possibly due to a new love triangle. According to US Weekly, Selena Gomez and Justin Bieber were recently spotted grabbing breakfast and going to a church service together. It wasn't long until Gomez and The Weeknd publicly announced their split and many wondered if it had anything to do with Gomez's new reconnection with Bieber. The couple previously dated back in 2011 until 2015, and now, sources say they're back together one more. In 2003, Billy Crudup and Mary-Louise Parker had been dating for eight years when they announced Parker was pregnant with their first child together, Page Six reported. But just a few short months before the due date, Crudup left Parker to be with Claire Danes. The summer before, Crudup and Danes were working together shooting their film Stage Beauty. Danes and Crudup were together for three years until they broke it off in 2006. While Parker never talked about the split out in the open, in 2015 she released a book of letters, one of which discusses how she dealt with the aftermath of her breakup, according to Jezebel. Joe Jonas and Taylor Swift were one of music's cutest couples. Well, until he broke up with her in a 25-second phone call, as she revealed on Ellen. 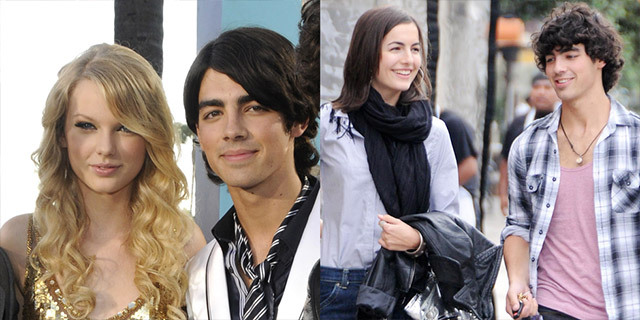 Not long after that, Jonas was seen hanging around with Camilla Belle, and Swift revealed to US Weekly that Belle was the reason why Jonas broke up with her in the first place. She used the breakup as the inspiration for songs like "Forever & Always" and "Holy Ground." Swift also took the time to write a song that was apparently about Belle called "Better Than Revenge," showing that her exes are not the only people she writes about. Ah, young love. Aaron Carter started dating fellow teen star Hilary Duff back in 2001, and was with her for two years until he decided to date Lindsay Lohan at the same time. Eventually, Carter broke things off with both Duff and Lohan in 2003, but not before things got heated between the two starlets in a feud that went on for years. Lohan even made fun of Duff on SNL back in 2004 (pictured above). Carter would later try to reach out to Duff on Twitter, but she denied him once again, breaking our early 2000s pre-teen hearts once more. 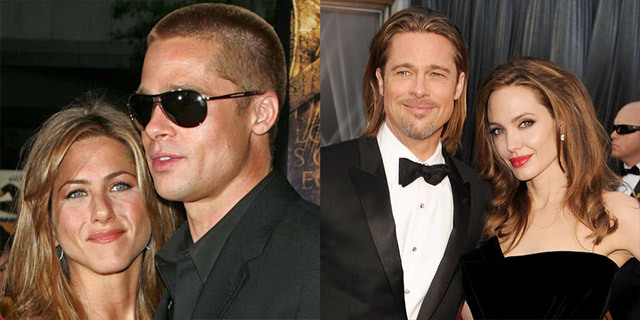 Brad Pitt and Jennifer Aniston were Hollywood's hottest couple when they started dating back in 1998. After two years, they got married in a $1 million celebration in Malibu, according to the New York Daily News. They seemed to be going strong until around 2005 when the couple announced to People that they were getting divorced. During that time, Pitt was working with Angelina Jolie on Mr. and Mrs. Smith and they soon started dating after the divorce announcement. Pitt and Jolie later become the new "It" couple and got married in 2014, but just last year, TMZ reported that Jolie filed for divorce. 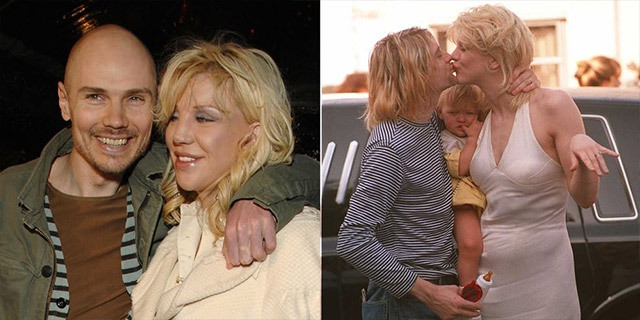 Courtney Love and Kurt Cobain will always be considered one of rock and roll's most iconic couples, but Love wasn't with Cobain from the beginning. Back in the '90s, Courtney Love originally dated Billy Corgan of The Smashing Pumpkins. Love revealed in an interview for the documentary Montage of Heck that the two later broke up because Corgan wouldn't pay for her to fly home after a show. The Smashing Pumpkins were playing with Nirvana at the time, so she ended up staying with the Nirvana band members. She began a relationship with Cobain, with whom she had a daughter, Frances Bean Cobain, she revealed in an interview. She said Frances Bean was conceived on a night she had meant to see Corgan. Meg Ryan and Russell Crowe were in Ecuador shooting their film Proof of Life in 2001 when tabloids found out that Ryan was cheating on her then-husband of nine years, Dennis Quaid, with Crowe. News broke around the world about the affair and Quaid soon filed for divorce, according to People. Ryan fought back against the allegations that the divorce was all her fault, alleging to InStyle that Quaid was also unfaithful to her during her marriage. Crowe and Ryan later split up and Proof of Life completely bombed at the box office showing that bad publicity isn't always a good thing. Debbie Reynolds and her husband were Hollywood royalty during their marriage. Reynolds told People in 2015 that she was close friends with Elizabeth Taylor after they went to school together at MGM. When Elizabeth Taylor married her third husband, Mike Todd, Reynolds was the matron of honor and Eddie Fisher was Todd's best man. Soon after, Todd died in a plane crash, and Reynolds and Fisher comforted Taylor as she mourned. Fisher soon left Reynolds and ended up marrying Taylor just one year after her husband's death. 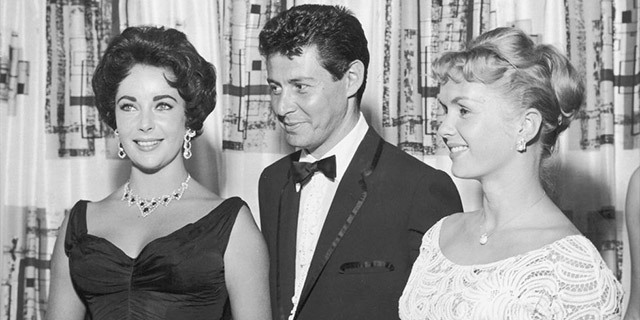 While Elizabeth Taylor would divorce Eddie Fisher after five years, she didn't repair her friendship with Reynolds until many years later. The two also worked together in a TV movie called These Old Broads before Taylor's death in 2011. Spencer Tracy and Katharine Hepburn were the perfect match when they starred together for the first time in Woman of the Year. Tracy, however, was already married to Louise Treadwell. The two met when they were in their 20s and had two children together. They had marriage troubles, but Tracy never left Treadwell because he was a devout Catholic and his religion did not allow for divorce, People reports. Tracy and Treadwell started living separately and eventually, Hepburn and Tracy began a relationship. They were together until his death in 1967, after they filmed their final movie together, Guess Who's Coming to Dinner. While it was an open secret that Hepburn and Tracy were together, it wasn’t until her book Me: Stories of My Life was released in 1991 that she openly talked about her relationship with Tracy. It started out like the perfect love story. Johnny Cash met Vivian Liberto at a roller-skating rink in San Antonio in 1951, according to the Los Angeles Times. Soon after, he was deployed to Germany by the United States Air Force. After three years and thousands of pages of love letters, the two married and had four children together, Liberto revealed in her book. Cash soon made it big and was constantly touring while also dealing with severe alcohol and drug abuse. 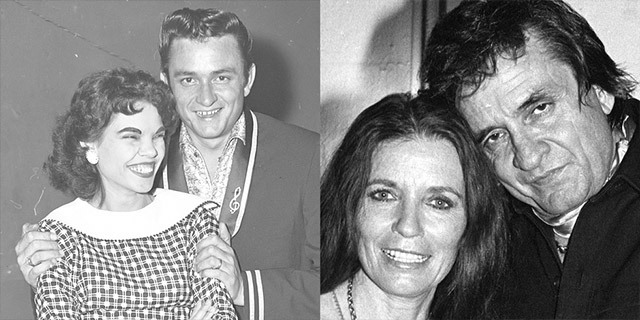 It was then that he met June Carter and they started to have an affair. 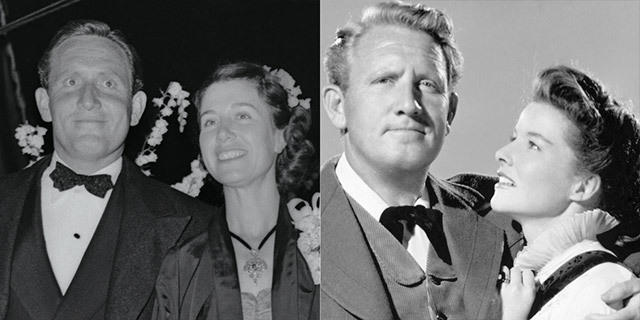 Vivian soon filed for divorce, and Cash later married June Carter. The two stayed together until her death in 2003. Cash's love letter to Carter for her 65th birthday is now considered to be the greatest love letter of all time.